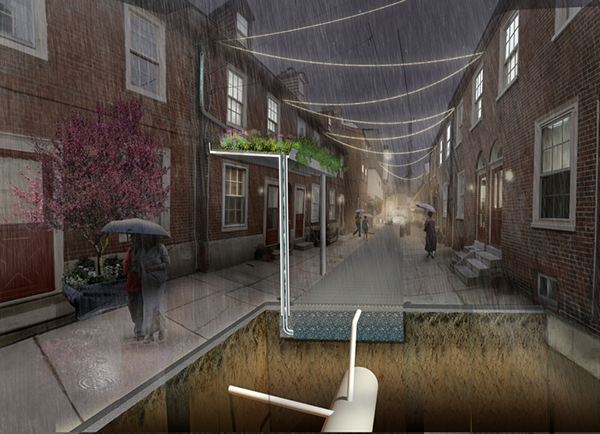 This national design competition was a catalyst to generate innovative, cost-effective ideas to serve as prototypes for green stormwater infrastructure throughout Philadelphia and the country. 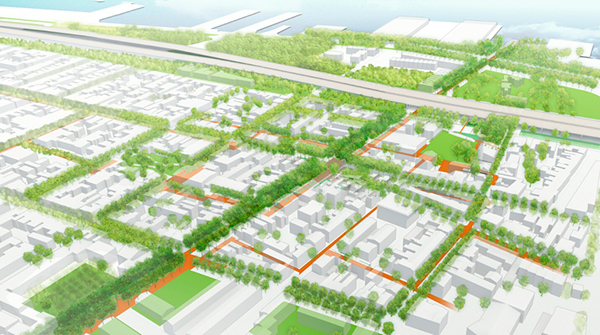 OLIN’s scheme “Meeting the Green” tackles the most challenging of the real urban retrofit sites, the Queens Village residential neighborhood. Residential scale stormwater interventions are the crucial key to revitalize urban neighborhoods and manage the quality and volume of combined sewer overflow events. Design interventions target strategic civic spaces: the neighborhood place of meeting becomes the “Meeting Green,” the pedestrian and transit friendly avenues “Linking Greens,” corner shops and places of community and religious gathering are reinvested as “Green Exchanges” and networks of alleyways and cartways as “Branching Greens.” Lastly, just as the City benefits from a connective tissue of meeting points and links the physical “Divides” are crossed to restore the neighborhood fabric. 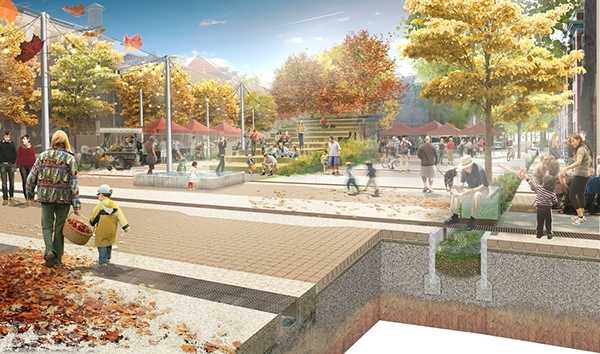 This integrated design embraces the core principles of ecosystem services restoration as articulated in the Sustainable Sites Initiative (SITES TM) by reusing non-potable water, increasing site permeability, utilizing canopy trees and native stormwater plantings. 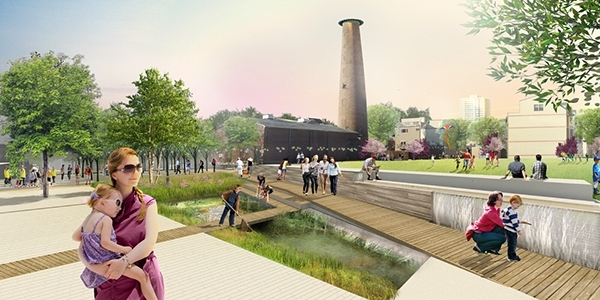 In Meeting Green, 42% of the impervious area of Queen Village is greened and runoff reduced by 41-43% with an estimated construction cost of nearly $13 million dollars countered by public private funding menu. The proposal creates a replicable model that balances the need to implement effective low cost projects with solutions that maximize the triple bottom line benefits of investing in neighborhoods. This initiative offers the opportunity to distribute the responsibility between the public and private sectors and incentivizes property owner participation. 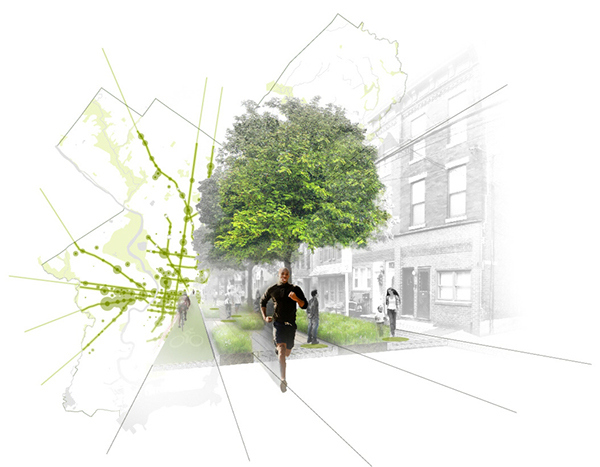 Design team includes: OLIN (Lead design firm), SMP Architects, PennPraxis of the University of Pennsylvania, Gilmore and Associates, Internationla Consultants Inc., MM Partners.